Freshly grated nutmeg to taste (optional). Fresh nutmeg taste different than store bought ground. Optional additions: ½ C slivered almonds, or chopped pecans; ¼ C fresh ground flax and or chia seeds. Wash, dry and dice rhubarb and strawberries or blueberries. Set them aside. In a bowl combine all dry ingredients. Add melted coconut oil. Mix with a fork until crumbly. Reserve to top fruit. Layer fruit in baking dish. 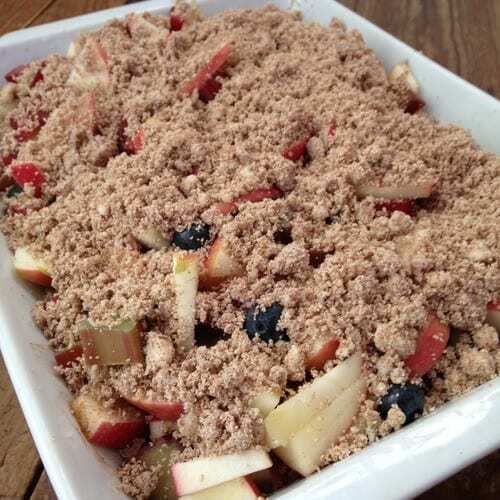 Top fruit with crumble, but do not pat down. Bake 40-45 minutes until bubbly and nicely brown. Serve with coconut whip cream or cashew cream for a wonderful dairy free CLEAN topping!